I first saw it, by chance, in ’94 or ‘5 whilst roaming through the boulders with my friend Kevin. We didn’t know if it had been climbed because we hadn’t heard of it and it wasn’t in any guide. It seemed improbable but we threw ourselves at it until our fingers looked like, well, the lass in the video. We found out later that it had recently been established by either local Tom Kleinfelter or Swiss bouldering legend Fredric Nicole. We were there to map the boulders for an article. Kleinfelter was insistent that we rate the problem no harder than V7 because he was afraid the old school locals would be offended if he tipped it as the hardest route in the area. In fact, it was much harder than anything there at the time. I still remember the caption, which was “sandbagged much? 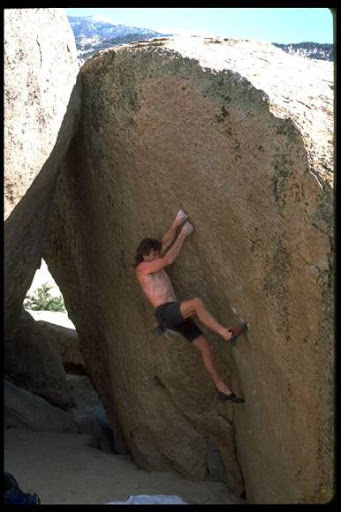 Kevin Thaw on Stained Glass, V7,” on the below photo (note “crashpad” of yore). Now a solid V10, the video shows Aussie Tilly Parkins nabbing the first female FA nearly 15 years later. Amazing considering that it’s a couple of minutes from the car in an absolute Mecca for elite boulderers. Congrats, Tilly! Wow, that is powerful. Diggin it! I do write for a living, so thanks. Josh, what was it Pottenger said, "grab some sack 'cause you're gonna need it" If you were TRAD you would have climbed right over the sucker. great vid!! inspiring and beautifully done. Now to be a real girl about it… what top is she wearing in the photo??!! amazing! !